Join us at MakeATX for a laser cutting workshop where you will learn the basics of laser cutting and get a chance to etch a personalized, laser cut design tool. Have you added laser cutting to your design tool kit yet? Join us at MakeATX for a laser cutting workshop where you will get a chance to etch a personalized, laser cut design tool on one of our three machines. At this workshop we will teach a quick lesson on the basic capabilities of laser cutters, the array of laser safe materials, and some special techniques for tackling unique laser cut projects. At MakeATX we help designers bring laser cut projects to life, ranging from intricate wedding invitations to large wooden signage and everything in between. We hope this workshop will inspire designers to create beautiful objects with a new skill set and a fresh perspective on the accessibility of laser cutting in Austin. No experience is necessary for this workshop and curiosity is always welcome! Kristen Von Minden and Eve Trester- Wilson founded MakeATX with the belief that having access to the proper equipment and workspace would not only allow them to make beautiful objects with their tools and their hands, but it would also allow them the possibility of making a modest living doing something they love. Both avid quilters, Kristen graduated from Harvard University Graduate School of Design with a Master of Architecture and Eve graduated from University of Texas with Bachelor of Architecture and Bachelor of Arts, Plan II. Devon Stonebrook manages Custom Cutting at MakeATX and she graduated from the University of Michigan’s Taubman School of Architecture with a Bachelor of Science in Architecture. 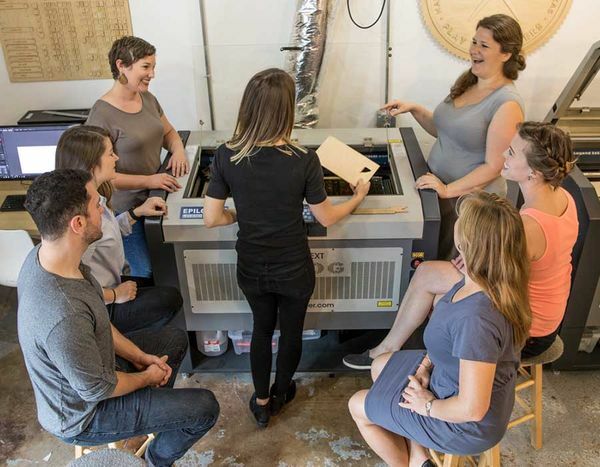 MakeATX is a laser cutting workshop in Austin, Texas that offers classes and memberships for local designers who want to learn how to operate the laser cutting machines. In addition, MakeATX offers Custom Cutting Services for clients who seek fabrication of customized laser cut projects. MakeATX is the headquarters of Bright Beam Goods - a line of laser cut games and homegoods which is sold across the country.